Iwatayama Monkey Park in Kyoto | Travel? Yes Please! As a big animal lover, I am always thrilled when I get to see wildlife on my travels. As educational as zoos can be, nothing compares to seeing an animal in its natural habitat, unconfined. So when I found out about the Iwatayama Monkey Park in Kyoto, where monkeys freely roam the hilltops, I just had to visit! So, after spending the morning exploring the sights in the Arashiyama district of Kyoto, we decided it would be fun to hang out with some Japanese macaques at the Iwatayama Monkey Park! Let me start by saying you really have to earn your time with the monkeys. It was a steep and steady climb up a small mountain to get to the park. I seriously lack cardiovascular endurance so the hike was a bit challenging for me. After huffing and puffing my way to the top, I still had enough breath left in me to laugh at what I first saw when we arrived at the park. Hanging off the fenced windows of a small building was a big group of monkeys. They were very impatiently bouncing around, making all sorts of monkey noises while they reached through the holes towards the people inside. Turning my attention away from the feeding frenzy going on at the building, I saw that there were monkeys everywhere! I suddenly remembered the sign on the trail warning us not to look the monkeys in the eye. Now I was nervous. Would they jump on me? Pull my hair? Steal my camera? Luckily, nothing like that happened. The monkeys were about as well behaved as you could expect monkeys to be. But just in case, there was a man whose job it was to shoo the monkeys (or people) away if they got too close to one another. While it was quite entertaining to watch the monkeys, I couldn’t help but have my attention stolen away by the fantastic view of Kyoto. Isn’t it just lovely? As we sat and enjoyed the scenery, monkeys were roaming around in the bushes and playing with the nearby fence. I loved watching their facial expressions- very human-like! After relaxing on the bench for a while, we finally decided to head on into the hut and take a turn at feeding the monkeys. We bought two small bags of food- peanuts and bananas. As we approached the fence some monkeys got quite excited, making all sorts of loud noises at us. Most of them though would just put their hand out to ask for food. It was pretty fun to feed the monkeys and have them take the peanuts right out of my hand. Still, I felt a little guilty because I had always been taught never to feed the wildlife. It didn’t take long for the monkeys to devour the food we bought them so we decided to call it a day and walk back down into town. All in all, we had a great time at the Iwatayama Monkey Park. Being able to interact with the monkeys and watch them playfully enjoy nature, not to mention the gorgeous view of Kyoto, made the uphill hike well worth it! 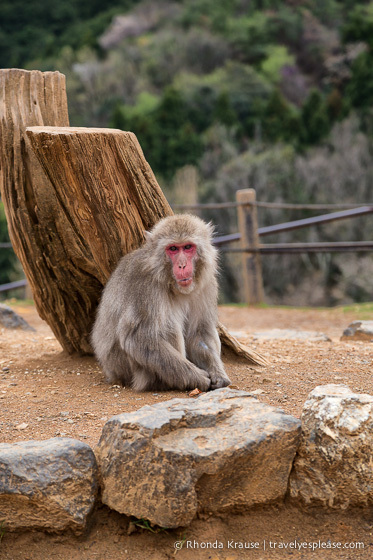 We definitely recommend visiting the monkey park in Arashiyama. It was an enjoyable and entertaining break from all the shrines and temples we saw during our three days in Kyoto. The Iwatayama Monkey Park is located in the Arashiyama district of Kyoto, a main sightseeing area about 8 kilometres from the city centre. To get to Iwatayama Monkey Park, cross the Togetsukyo bridge towards the hills. Upstream from the bridge there’s a flight of steps leading to the entrance. 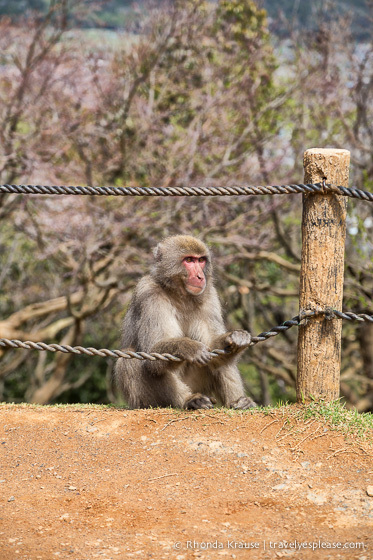 Admission to the Iwatayama Monkey Park costs ¥550. To reach the monkeys it’s a steep 30 minute (approximate) hike from the entrance. Iwatayama Monkey Park is open from 9:00 am-5:00 pm (March 15- September 30) and 9:00 am- 4:30 pm (October 1- March 14). It’s closed during heavy rain and snow. The best time to visit Iwatayama Monkey Park is between March and September (this is the birth season and your best chance to see baby monkeys). Another good time is in autumn when when the maple trees along the trail are changing colour. Do not bring your own food to feed the monkeys. You can purchase some monkey snacks inside the building where you feed them. Do not give food to the monkeys when you are outside the building. There are restrooms at the entrance to the park and at the top of the hill. You can also purchase drinks in the rest building at the top of the mountain. Another place to see wild monkeys in Japan is Jigokudani Monkey Park near Nagano. 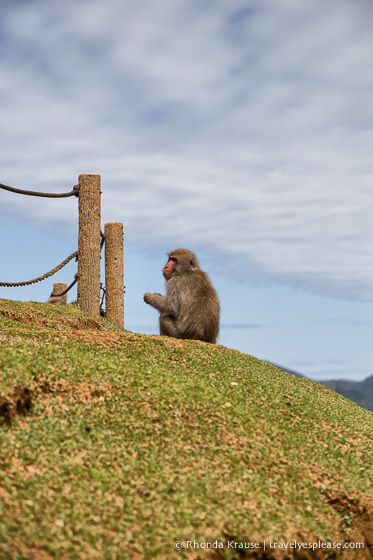 The snow monkeys love to relax in the hot springs here. For your convenience, here is a list of hotels in and near the Arashiyama district of Kyoto. Please consider booking your Arashiyama accommodations through the included link. It costs nothing extra and helps support this website. Thank you!